They don’t play baseball, lacrosse, soccer or softball together. But since April a group of about 100 construction workers have come together as a team to build quite possibly the area’s most important project in decades. Take a drive down Cleveland Road (U.S. 6) between Sandusky and Huron to see a completely changed corridor. 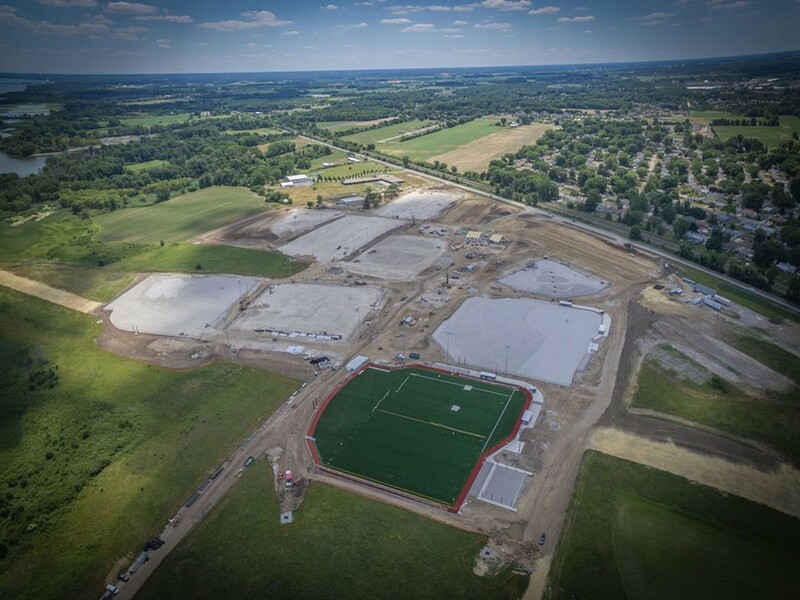 Once-barren land now features structures, light poles, outfield fencing and, in some spots, green turf covering playing surfaces. “We’ve been doing a lot of work, but people now have a visual to show how we’re moving forward,” said Brian Storm, president and CEO of The Sports Force. The Georgia-based management company is investing, supervising and managing this $23.5 million multi-stadium complex, known as Sports Force Parks at Cedar Point Sports Center. After breaking ground in April, several rainy days greeted about 100 construction workers at the 57-acre site. But the warmer weather paired with a relentless commitment from contractors since then makes executives feel confident about finishing all work by fall and debuting this complex for youth tournament games come springtime. Read more at the Sandusky Register!